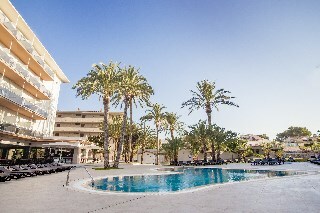 This charming beach aparthotel boasts an enviable location in the exciting tourist resort of Playa de Palma. The complex is situated just 50 metres away from the beautiful sandy beach and is just a few steps away from the wonderful tree-lined promenade. Guests can explore the town with ease where they will find an abundance of delightful shops, exquisite dining options and vibrant entertainment venues. This modern hotel is nestled amidst a shady garden with swaying palm trees. The stylish apartments provide a home away from home with comfortable surroundings, a tranquil ambience and modern amenities for guests' relaxation and convenience. The complex enjoys a host of excellent leisure, dining and recreational features which guests will appreciate.